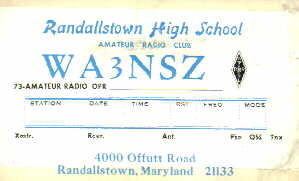 The radio club was founded in 1970 with the opening of Randallstown Senior High School. Here is the Constitution from the club's creation. Here is a certificate from the ARRL from 1977. 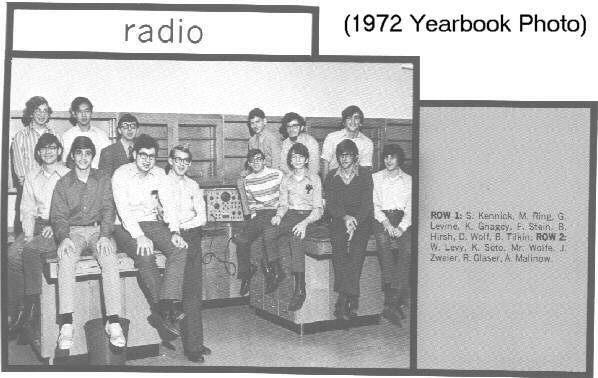 Over the years the individual members have gone their separate ways and spread out across the country, yet a core group of the original "hams", joined by others attracted to the club, have gotten together every year to participate in the American Radio Relay League's Field Day activity. On the Field Day weekend, thousands of Amateur Radio operators in the U.S. and Canada set up their stations in the open using only emergency power and portable antennas. They contact as many operators as possible in the 24-hour period. These tests are designed to help hams refine operating skills so necessary during disasters and times of emergency when normal channels of communication are disrupted or unavailable. The annual event has become somewhat of a reunion, being the only time many of the group see one another any longer. The club first participated in Field Day in 1971 and has never missed a year. Members currently reside in California, Florida, North Carolina, Pennsylvania, Virginia, and Maryland. In recent years the local club has set up operations in Washington Monument State Park, west of Frederick on the Appalachian Trail, at an elevation of 1830 feet. They always seek high spots in order to strengthen communications. When the FCC abandoned club licenses, the group began operating Field Day under callsign N3IC.